I was thinking on which manga to share with you all this week. There were a few that crossed my mind, but they are fairly well-known. I am only filling in while Mara is busy, so I want to bring your attention to things that you might not have heard of or that are coming soon. For that reason I chose Yo-kai Watch. Now Yo-kai Watch is a shonen (young boys) comic written by Noriyuki Konishi that runs in CoroCoro Comic. There is also a shojo (young girls) spin-off series as well. It is incredibly huge right now in Japan among young boys and girls; think like Pokemon huge. In 2014 it won the Kodansha Manga Award as Best Children’s Manga. As adults we might not be too interested it. However, if any of you have kids then be prepared for Yo-kai Watch. 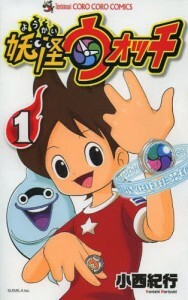 The manga is based on the video game of the same name by developer Level 5. It is very similar to the Pokemon series. The main character Keita meets his youkai butler, Whisper, and is given a Yo-kai Watch. With the Yo-kai Watch he can see various youkai in the world or summon those he has befriended. Okay, now I have said “youkai” a bunch, and you are probably wondering what it means. It is a hard word to directly translate, but youkai are ghost, spirits, and/or demons. While many youkai are “ghosts,” not all youkai were human in a past life, and some did not even die to become a youkai. When people start acting strangely or out of character that could most likely be caused by the presence of a nearby youkai. Different youkai affect people in different ways. It should be noted that we ordinary folks cannot see youkai, and that is the importance of the Yo-kai Watch. Keita lives in Sakura New Town (Japanese equivalent of Anywhere, USA), and the manga focuses on his adventures at school and around town as he explores and discovers the mysteries of the youkai world. His first youkai friend is Jibanya. He is probably the equivalent of Pikachu. 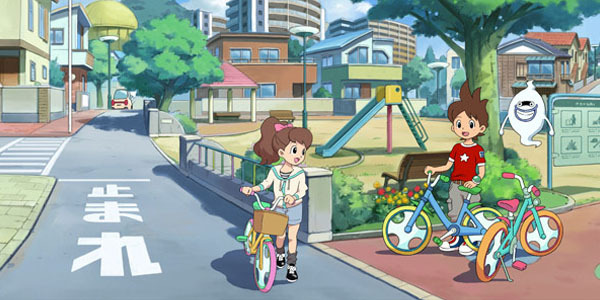 Even though there is all this magic and mystery, Yo-kai Watch provides a pretty apt look at daily life in Japan, especially though the eyes of an elementary school student. I worked in an elementary school, and I saw my students having the conversations and following the same routines that Keita and his friends have. That is probably why this book has caught on with the youth (and some adults as well). The scenarios are relatable. Remember when your friend decided to not talk to you one day and started hanging with the cool kids, but came crawling back after he realized he was acting strange. Yeah, that was probably a youkai sitting on his shoulder. Grander stories also run through the series as well as events can build to bigger more dangerous mysteries. A few weeks back Mara talked about Sailor Moon. That follows a villain of the week/issue format with an overall story building in the back. I would like to go back and talk about the increasing popularity of Yo-kai Watch in Japan. In addition to the manga and video game there is an animated series. There are toys and medals to collect. In the game when you befriend a youkai they give you a medal so you can call on them later. It is kind of like a coin you can put in the Youkai Watch to summon them. Of course this is something that is manufactured as a collectible. (Remember Pokemon cards? Gotta catch them all!) They have QR Codes on them, and you can scan them with your Nintendo 3DS camera to unlock items and youkai in the game. Yeah the marketing here is crazy. The video game is actually pretty damn fun, and very well made. There is an entire city to explore, and in the sequel several small villages as well. It’s almost like a Grand Theft Auto for kids. There are story missions, but a ton of side quests and games to discover. Unlike GTA though, kids are not being encouraged to do bad things. You get bonuses for crossing the street a certain number of times in a row when the light is green. Jaywalk too many times and a pretty strong youkai appears to punish you. It rewards kids for making the right choices. Despite some of the poop and fart jokes (it is a huge cultural thing in Japan. They love their poop! ), the game, anime and MANGA teach kids to be polite and how to make the right decisions in life. So that is it for my last Manga Monday. More of a Public Service Announcement for all you parents, future parents, teachers, kids, and consumers. There is this manga that has a video game, anime series, and an incredible marketing force behind it. There is no way you will be able to avoid Yo-kai Watch once it gets localized. I’ve enjoyed sharing some whacky manga with you these past two weeks, and if I get the chance to come back, I’ll share a more slice of life series with you all.